Travel to a haunted estate to find your missing aunt! In Disney Ghosts of Mistwood, your beloved Aunt Virginia has been kidnapped, and she needs your help! The Dark Spirit has hidden her somewhere on your family’s haunted estate, and she’s counting on you to save her from his clutches. 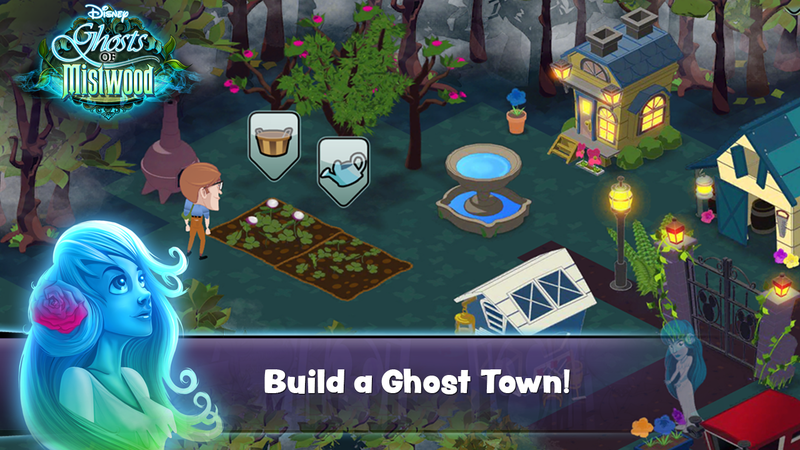 Embark on your search for clues by helping Mistwood’s ghostly residents restore the Mistwood family estate to its former glory. – Hundreds of Crafting Recipes. – Dozens of Ghosts and Characters to meet. – Customize your estate with unique buildings and decorations. – Explore the Estate and beyond to solve mysteries. – Exchange rare ingredients with your friends. – Download now and play in your choice of English, French or German! – Internet connection is required to play Ghosts of Mistwood. – Requires OS 2.2.3 or later. Solve mysteries and find your aunt – play Disney Ghosts of Mistwood now!